These days car is a must have for any family. A good car offers great comfort and joy of driving together to the family’s favorite picnic spot. Buying a car is all the more budget friendly now, when you visit droom.in. For all those looking for a stylish car, Droom has just come up with an outstanding offer. Droom Auction is now giving a chance to shop Hyundai Santro Xing GL 2007. This used Hyundai Santro car is surely a best bet right now. In stunning maroon color, this car offers a lot of style and comfort. The minimum bid is ₹9,999 only; you can start bidding for this used car. This auction will be ending Wednesday March 25, 2015. You can even purchase it right away at Buy Now price ₹190,000 only. The benefits don’t end here, as we are also providing other benefits worth ₹7,500. You get a certified car certificate, 100 day warranty and title transfer. Isn’t it amazing! Get ready for over the head summer vacations and plan a family get away in your own car. Catch up with this auction now to buy Hyundai Santro Xing at your most lovable price at droom website. Droom is India’s first marketplace to buy and sell new and used automobiles online. We also offer multiple savings options for both buyer and sellers with droom offers and coupons. Take their benefits right away and shop now. Hi my name is Janette and I just wanted to drop you a quick note here instead of calling you. 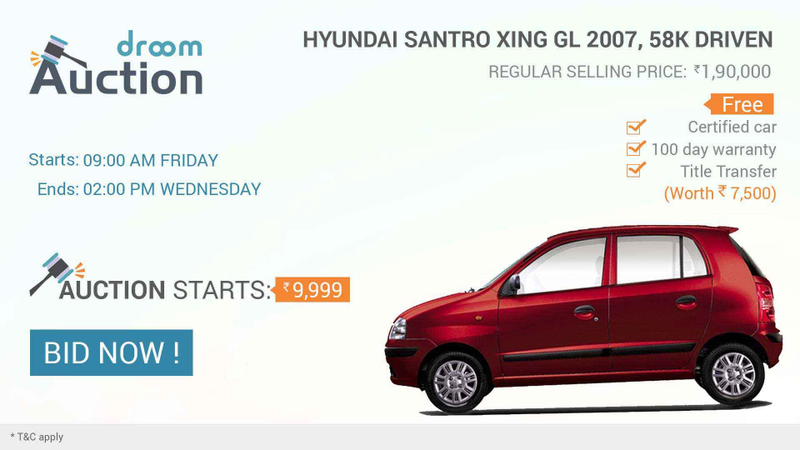 I came to your Droom Auction: Hyundai Santro Xing GL 2007 starts ₹9,999 – blog.droom.in page and noticed you could have a lot more visitors. I have found that the key to running a successful website is making sure the visitors you are getting are interested in your subject matter. There is a company that you can get targeted visitors from and they let you try their service for free for 7 days. Yes, Janette – please let us know how we can help. I visited various web pages however the audio quality for audio songs current at this web site is actually excellent.